Motorcycles are – obviously enough – the sum of their parts. You need an engine, a chassis, some suspension and wheels to connect them to the road, and the ergonomic package that allows the rider to control the bike itself. The weird thing is that sometimes manufacturers put a bike together in a way where the sums don’t add up. Take Yamaha’s SRZ660. The lovely 660cc single from the trail bike was squeezed into the exquisite deltabox chassis from the sweet-handling TZR250 two stroke, then wrapped up with dropped bars, alloy wheels and a half-fairing, assembled in Italy. The result should have been a lightweight, sharp-handling, punchy and inexpensive sports bike. In fact what we got was an overpriced, crudely finished, dubiously-handling, ill-tempered beast with dysfunctional trail bike gearing that made it complete PITA to ride on the road. Of all the bikes I’ve ever ridden the SRZ was the biggest let-down. Ducati attempted the same parts-bin trick with their Monster 600. The v-twin engine lifted from an uninspiring model when wrapped in a low-tech steel frame and topped off with a chunky fuel tank and minimalist bodywork produced a motorcycle that was surprisingly tiny and agile. When I rode Ducati’s 620 Monster a few years later, I was fully prepared not to like it. I suppose quirky looks and a reputation for dodgy electrics and expensive servicing meant I was just a little prejudiced against the bike, particularly coming from my background of courier and motorcycle instructor where ease of use and reliability are all-important. In fact, I had a blast – it was not only easy to ride, it was enormous fun to ride. And though I would never have bought one for my job, the ear to ear grin in my lid explained just why the baby Monster appealed to the first time rider and went on to be a huge sales success. Nevertheless, the fact that the Monster wasn’t a horrible lash-up like the SRZ was almost certainly more luck than judgment. The results – and sales – almost certainly wildly exceeded the cash-strapped factory’s expectations. In theory, a bike that’s been designed from scratch should enable the manufacturer to avoid the parts-bin mismatch trap and the ‘ground up’ route Yamaha is therefore what have gone down with the MT-07. But one glance shows they have also taken a leaf out of Ducati’s book of Minimalist Motorcycle Design. The overwhelming impression looking at the bike is that there’s not much of it. It looks small, it’s got a humpy tank, not a lot of seat, and there’s a lot of open space either side of the compact motor. Colour me red and it wouldn’t look dissimilar to the Monster at all. The all-new chassis is – like the Monster – steel and tubular. The press information pack talks of the use of different types of high tensile steel in different locations, which means a saving of 6kg over the steel frame wrapping up the middleweight XJ6 from the same manufacturer. Mind you, the XJ6 frame is cradling a much heavier four cylinder motor. No expensive alloy for the swing arm either, it is also low-tech steel. The suspension similarly budget. There’s no rising-rate linkage at the rear, the single shock is straight push and un-adjustable other than for preload. At the front, the right way up forks are basic too, without even preload adjustment. Presumably for styling reasons rather than any need for traction, Yamaha have plumped for the near-universal 180 section rear tyre on the ten spoke alloy wheel. The XJ6 with a similar power output copes perfectly well with a narrower 160 section. The heart of the beast, visually and practically, is the all-new 689cc inline twin cylinder engine which according to Yamaha “benefits from our special ‘crossplane philosophy’ which enables it to develop linear torque for outstanding acceleration”. I won’t bore you with yet another explanation of what the 270 degree crossplane crank design is all about, suffice to say that the double overhead cam motor punts out a maximum of 55.0 kW (74.8PS) up near the red line at 9,000 rpm and you can find peak torque of 68.0 Nm (6.9 kg-m) at 6,500 rpm. The four valve bores are oversquare at 80.0mm x 68.6mm and the motor drives though a six speed gearbox. OK, so that’s the specs? What’s it like on the road? 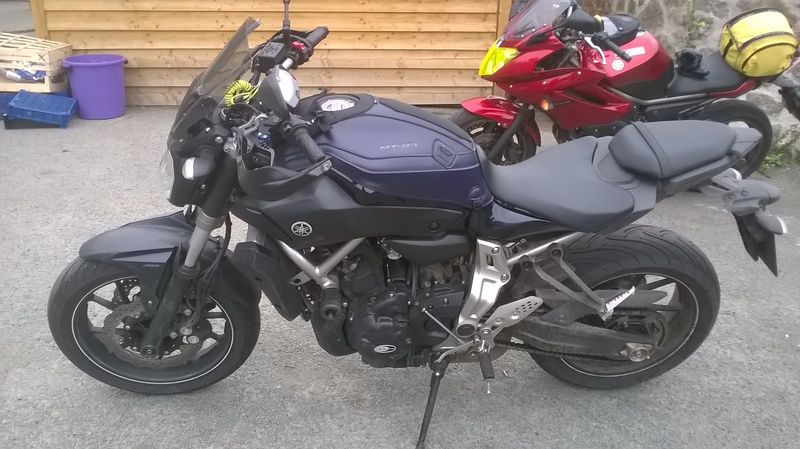 I got a chance to test-ride one on my latest training session to Wales and compare it with Yamaha’s other current offering, the four cylinder XJ6 which I own in Diversion format. My first thought was “blimey it’s light”. Rather than heaving it off the side stand, something you have to do with the fairly porky XJ6, it lifts upright with barely any effort. The twin cylinder engine undoubtedly helps with the light weight – no less than 30kgs less than the XJ6 – but it feels like the 179 kilos are carried quite low, too. The second thought was “blimey, the seat’s high!”. That was a shocker, as I’ve read elsewhere about the 07’s low seat. It’s not. It’s actually actually 805mm off the ground – compare that with the 785mm height of the XJ’s seat. I’m a fairly average 5’9″ (or 1.75m if you prefer) and wasn’t quite able to get my feet flat on the floor on the twin, something I can do easily on the Divvie. The rider’s seat itself looks like a modern interpretation of the huge buckets seats you’d find on an old between-the-wars Indian or similar. Incredibly narrow at the front – which probably accounts for the low seat reports – and incredibly broad at the rear, it could be incredibly comfortable. The jury is out on that one, it wasn’t bad, but it wasn’t perfect. There were two hard ridges towards the front of the seat that dug into the insides of my thighs right from the very first. I can’t say I was squirming after my test ride but I can also see a reason to produce an aftermarket seat to fit the MT. Passenger accommodation is predictably sparse and two-up touring isn’t going to be this bike’s forte. For me, the footpegs are about 10cm too far forward. I could live with them but instinctively wanted to put my feet further back to have a bit more weight on my feet and rather less on my bum. The bars seem very close to the rider, with a strange pull-back angle built into them. You seem to be sitting well over the front Monster-style, but a look at the side profile of the bike shows that you’re actually quite a long way to the rear, thanks in part to the short wheelbase. Although the bars seem quite flat the riding position is rather upright. I’m not sure I wouldn’t want to lean into the bars a little more. On the move, there were moments at low speed when the bike seemed a little keener to tip into a corner than I was expecting. It may have something to do with the front end geometry (24.5º caster angle compared with 26º for the Divvie) or it may be the Michelin Pilot Road 3s fitted to this machine. I recall similar behaviour on them before on other machines. It never felt uncontrollable, but it wasn’t entirely predictable either. Once rolling the steering is oh-so-light. Blink and it’ll change direction. It makes my XJ6 feel like a lumbering wildebeest by comparison. But it also pulls off the trick of remaining stable. I tried upsetting the MT by firing it hard over bumps and crests. Not even a hint of a wobble as the front went light. The suspension felt a bit wooden over the same bumps, though. A bit too firm and unyielding, it transmitted road shocks directly to my spine. It’s better than too-soft suspension, to be sure and perfectly adequate for normal riding but you can feel the difference between the budget suspension on this bike and something adjustable on a more upmarket 600 supersport. The clutch is light, the gearbox precise. As for the brakes, they stopped the machine but were less powerful than I expected. Having failed to notice the twin discs and four-piston Monobloc caliper set-up before I jumped on and went riding, I genuinely thought I was riding a bike with a single disc. Having spotted the twin discs, I would have suggested that they needed properly bedding in but other reviews have made the same observation. The rear works fine and offers plenty of control for slow riding and awkward turns. Rather disappointingly on a new model, ABS is only an option on current models and will set you back £400 extra. So expect to see the on-the-road price climb when it becomes compulsory. You get a 14 litre tank (just over 3 gallons to imperial thinkers like me) and although that might seem small, with the MT’s fuel consumption on the trip averaging over 60mph, that’s going to give a to-empty range approaching 200 miles, which is probably more than your backside will manage. This particular machine had a small fly screen fitted, which kept off more wind than it had a right to, plus bark busters on the bars. 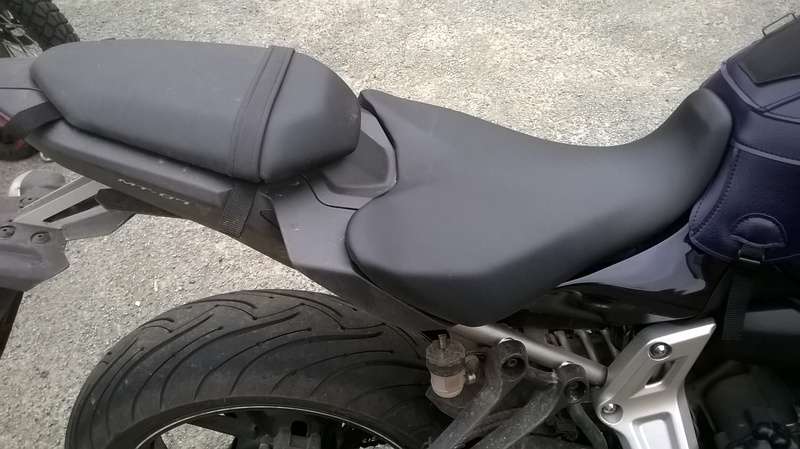 Both would aid rider comfort on longer runs, although they can’t match the Diversion’s half fairing for protection. I really didn’t like the switch gear. It looks and feels a bit Micky Mouse, reminding me very much of the kind of equipment you find on an off-roader that’s been made vaguely road legal as an afterthought. It works, but the indicator was a bit fiddly even with summer gloves. The less said about the instrument panel, the better. The information it provides is basic, but there’s no need for it to be displayed in so ridiculously small a unit. Crammed in with a digital speedo and fuel gauge and the standard idiot lights is a truly nasty digital linear rev counter. I’m long-sighted and the scale on the rev counter is invisible without reading glasses – this is unforgivable and Yamaha should realise not everyone riding this bike will have the eyesight of a 20 year old. Worse, the red line is so faint as to be next to useless. 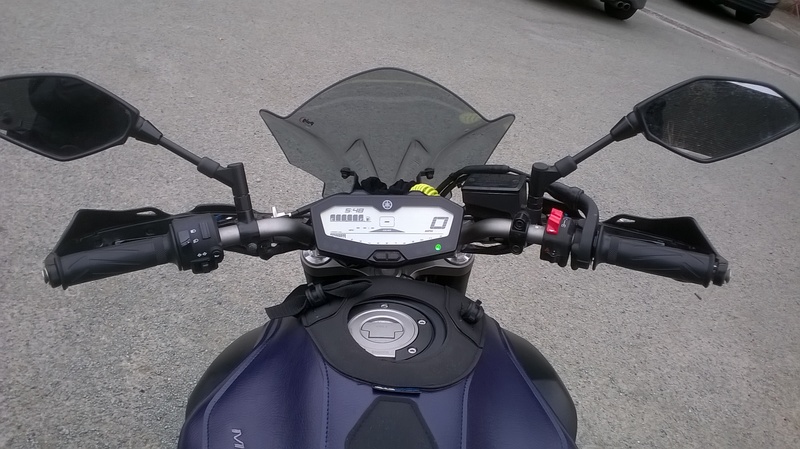 The digital speedo is legible, but the whole assemblage is so low down and tucked so far back towards the rider – the ignition switch is ahead of it -as to require a deliberate dip of the head to read it. The XJ6 instruments are barely any bigger but far easier to read thanks to the analogue rev counter and more sensible positioning. Another fail are the mirrors. They are a trendy diamond shaped and unbelievably hopeless for their primary job of seeing what’s around. The widest part of the mirrors, just where you can see most, tapers to a narrow point. Set them up so you can see behind and you can’t see to the sides. I haven’t mentioned the motor yet, have I? That’s because I’ve saved the best till last. On paper the engine’s nothing special. 70-odd horsepower from a 700cc twin cylinder engine is nothing new. Sure, the MT-07 will out-perform Honda’s CB500 / NC750 twins but Triumph’s Bonneville produces much the same power, as does Kawasaki’s ER-6 and the venerable SV650. Heck, the CX650 of the 80s was only a few hp down on this all-new bike. They all – MT included – have a top speed somewhere in the 115 – 125mph bracket. But it’s not the power so much as the feel. To my mind, Yamaha’s internal jiggery pokery has managed to replicate the sensation and delivery of my favourite engine design, the single cylinder. Unlike Honda’s old Superdream where the balance shafts smoothed the engine out, or Suzuki’s GS500 which felt a bit buzzy, this motor ‘thuds’ when you open the throttle; there’s an immediate visceral sensation that there’s some serious work being done down below. And there is – there’s enough immediate thrust even at relatively low revs to push you back on the seat. Following the 07 on my XJ earlier that day, it had proven capable of a surprising turn of acceleration when overtaking. But unlike a big single it’s flexible too. Yes, drop the revs too low – somewhere below 2500rpm as best as I could make out from the illegible rev counter – and the twin cylinder shudder sets in. You can’t get a twin to pull from tickover like the four cylinder machines will do but make your take off with just a little clutch then keep the revs up above 3000 and it pulls lustily all the way to the red line which is well above where you would find it on a big single. I’d like to see a torque curve because I suspect it will turn out to back up Yamaha’s claim that it’s flat. As a result, the motor is surprisingly capable of being ridden in just a couple of gears on twisty roads just like a four cylinder engine. Rather than constantly snicking up and down the box constantly in hunt for peak power, using the rev range in each gear delivers more than adequate drive. It’s far easier to ride that way and you won’t lose any ground on a real road. So let’s sum up. To my mind that motor helps the bike exceed the sum of its parts. No, it’s not perfect. The mirrors and instruments are awful and the seat and switchgear iffy. Yes, the suspension is budget and would ultimately be a limiting factor but it’s bolted to a competent and lightweight chassis. Certainly the motor’s not producing anything outrageous in terms of power and apparently it often stalls just off the idle, but when revving it delivers its power perfectly for real road riding, all with plenty of added grin factor. Like the Monster I rode all those years ago, Yamaha have pulled off the same ‘greater than the sum of its parts’ trick. Add in a competitive price, Yamaha reliability (one hopes) and decent-looking build quality, what you get is not just a total hoot of a bike to ride, it’s a bargain buy that will make sense to a lot of riders looking for a go-anywhere, do-anything solo road bike.